Interval training can make you sound and healthy. It is something that doesn’t require more time. You can become fit in the lesser period of time with a little effort on the routine basis. You don’t have to hit the gym for many hours instead you can do this easily at home as well as it doesn’t require any professional or costly equipment. Interval workouts are the one in which you change the periods of high-intensity exercise into low-intensity recovery. The high-intensity periods are usually at or close to anaerobic exercise, while on the other hand, the recovery periods involve the activity of lower intensity. It will burn more calories in short period of time as compared with many other cardio exercises. It’s not like you have to do the same thing for the whole week because there are a variety of different interval exercises and you can do it one by one each day. The basic good point of interval training is how you get the most out of interval training. There is no hard and fast rule in interval training. You just have to follow some basic rules and that’s it. Even for these interval exercises, you won’t require any gym trainer or specific gym equipment which is why this is considered probably the best ممارسة لانقاص الوزن and staying fit and healthy. علاوة على ذلك, you can adopt different variations as there is a huge pile of interval training exercise techniques. There is a term used for Interval training or interval workouts in running which is called interval runs. Interval runs are short and intense efforts and these are followed by equal or a bit extended recovery time. فمثلا, after a warm-up, run two minutes at your best effort, which will be followed by two to three minutes of easy jogging or walk to catch your breath. It is all dependent on you that what interval exercises you chose for yourself as a different type of فترة التدريبات التدريب will bring different benefits. So it is important that you should select suitable exercises for your concerned health issues but no matter whatever exercise you will select, they all will be in your favor and will surely benefit you in the end. We are going to mention starter interval training exercise. You should start with it in the beginning and you will start seeing the difference within few days. But keep in mind some things, before starting interval training. No doubt Interval training is an extraordinary ممارسة لانقاص الوزن and to stay sound and healthy, but it is tough and if you are just going to start a workout and you have not done exercise from a longer period of time then you should spend few weeks on building your stamina with a cardio workout. After few weeks of cardio workouts you will gain some stamina and then you can add interval training in your daily routine exercise. 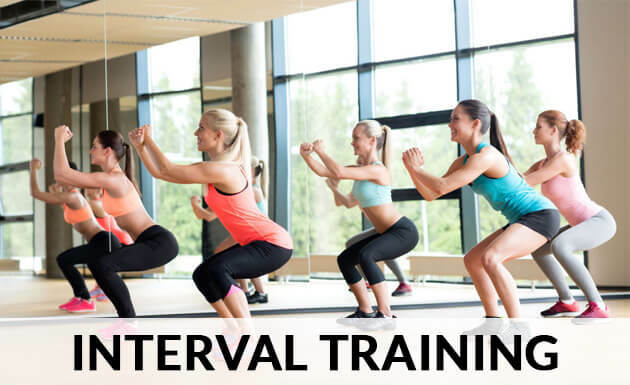 If you will add the interval training in your gym routine it will burn your calories faster.